There is no doubt that it’s pretty. Muted hues of orange, yellow, green and more alternate on the skinny buildings. Some are adorned with elaborate casings and paintings. 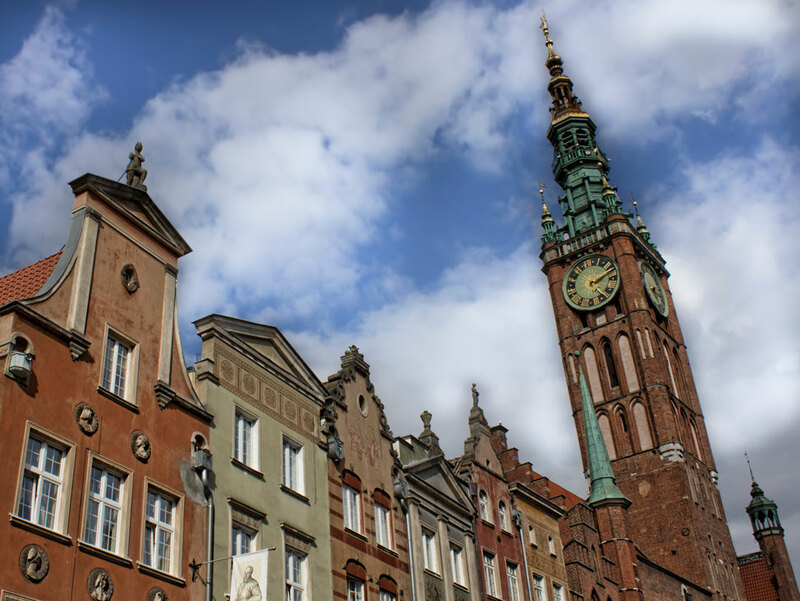 The clock tower anchors and dominates Dluga (Long) street, with St Mary’s Church, the largest brick church in Europe, just off to the side. But as we wandered through Gdańsk old town, I couldn’t help but be distracted by something else. 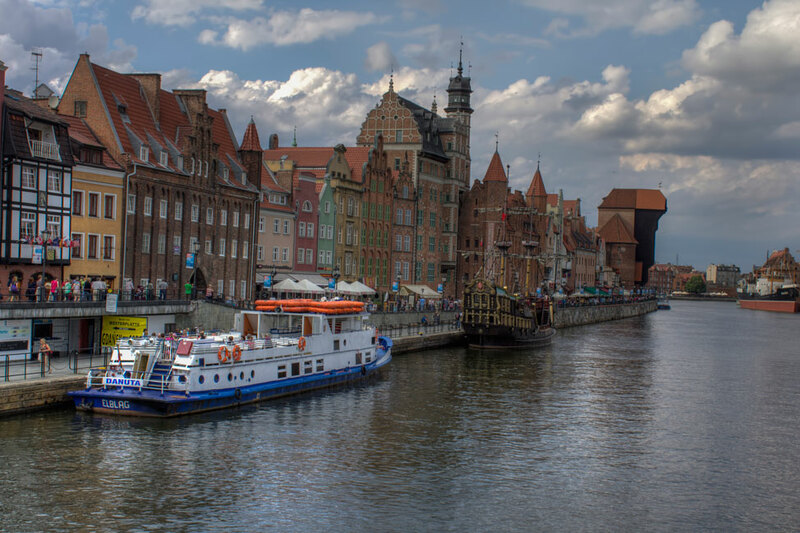 90% of Gdańsk was destroyed in WWII (then known as the “Free City of Danzig”), in fact, the first shots of the war were fired just a few miles away from the Old Town as Germany began their invasion into Poland. Following the end of the war, much debate existed over how to reconstruct the city. Harsh anti-German sentiment wanted to rid the city of all remnants of it (leading up to the war, Germans constituted the large majority of the population), but much debate continued over how to reconstruct it. An homage to the old days, and, which period? Modern architecture? Socialist realism (Soviet)? The result? A complete mix of old and new with a variety of influences within the structures, and the old world painted right on top. And, as another traveler suggested to us: “it’s kinda Disney-ish”. “It’s all fake,” the lady at the tourist information office had bluntly proclaimed just minutes before our maiden walk into Old Town. I could understand where he and the tourist office employee were coming from. Some elements to the facade are questionable, over-the-top even, and definitely don’t speak to the “old world” feel that is intended. But ultimately, how can it? This small city, all but destroyed in a war, will never have all the elegant antiquity that other cities across Europe manifest. 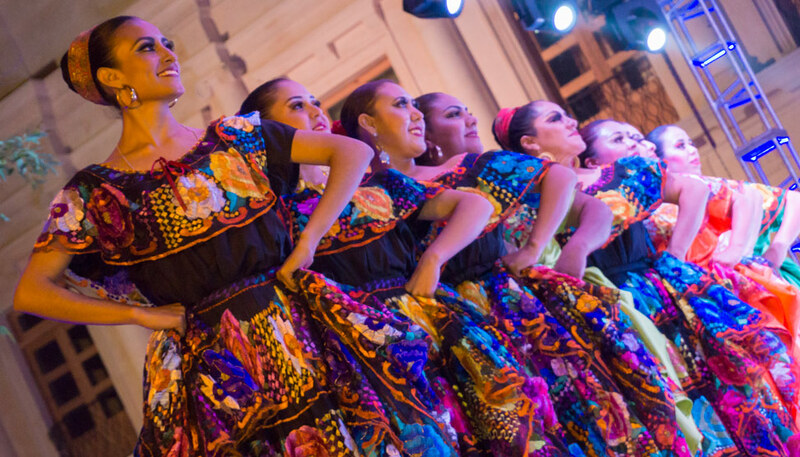 But that doesn’t mean it is lacking for charm – spending just five minutes in the center we were enamoured with the many talents of the variety of street performers, the clock striking on the impressive Town Hall tower, and the buzz of boats and people along the canal. 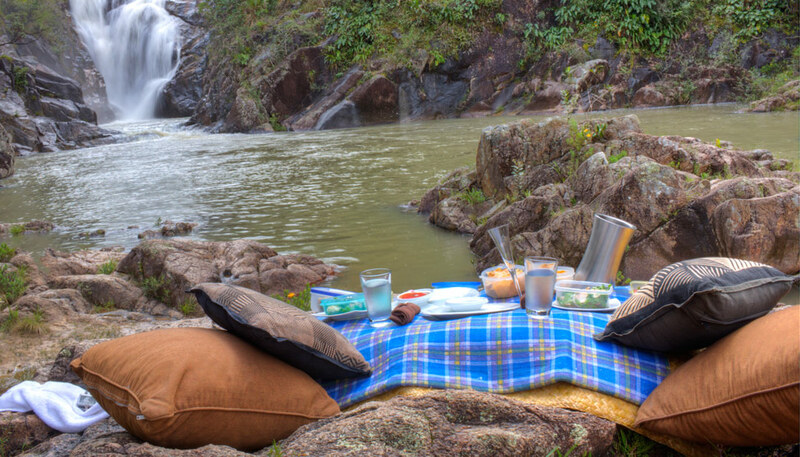 Looking beyond the outward appearance of any place should be the endeavour of any thoughtful traveler anyways. 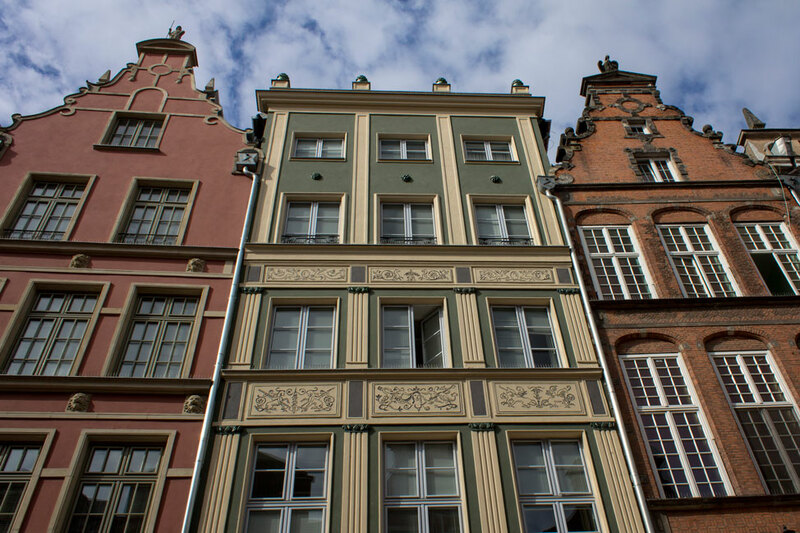 Taken at face value, and being mindful of its tragic past, Gdańsk carries considerable appeal, well beyond its curb. It’s not just Gdansk too, unfortunately. Much is the same in Warsaw (at least in the old town). That last picture is just spectacular! Sure beats the massive concrete blocks that form the architectural heritage of half the ex-Soviet republics and most of Eastern Europe. They could have done something totally new, though. But it still looks very at home in Poland. I have to say…we visited a very Soviet-ish part of Warsaw yesterday, and I liked it. Yeah, they are big massive concrete blocks, but there are parts of that architecture that are really appealing. The strength in them, I suppose. 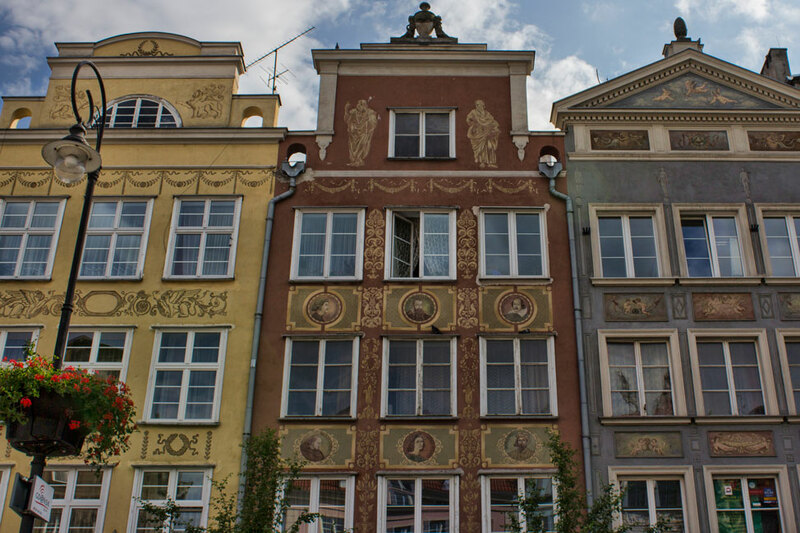 Not only Gdansk is left with restored facades, many cities in my country ( for example Warsaw) have whole old towns rebuild after WWII in the old style. Yes, we discovered that since we arrived in Warsaw as well, and also learned just how flattened the old town was in the war. 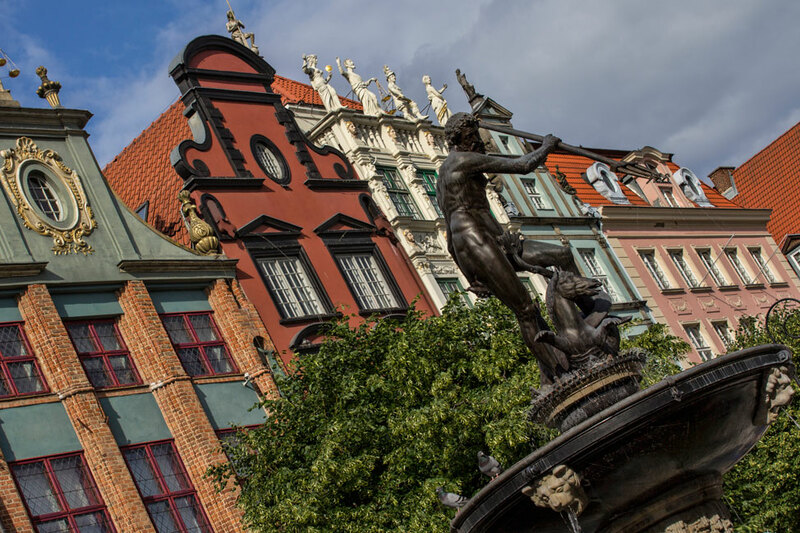 We quite liked Gdansk a lot, actually, we’d love to go spend more time there! That is one way to look at it. Although some of the paintings were a little over the top, I could agree to that. There is much more to the city then the old town though! It looks like a sweet city. I’m not sure I made that it’s fake. That in and of itself is a story. That is the truth Bethaney. It is an amazing feat in itself that they’ve bounced back like they have. 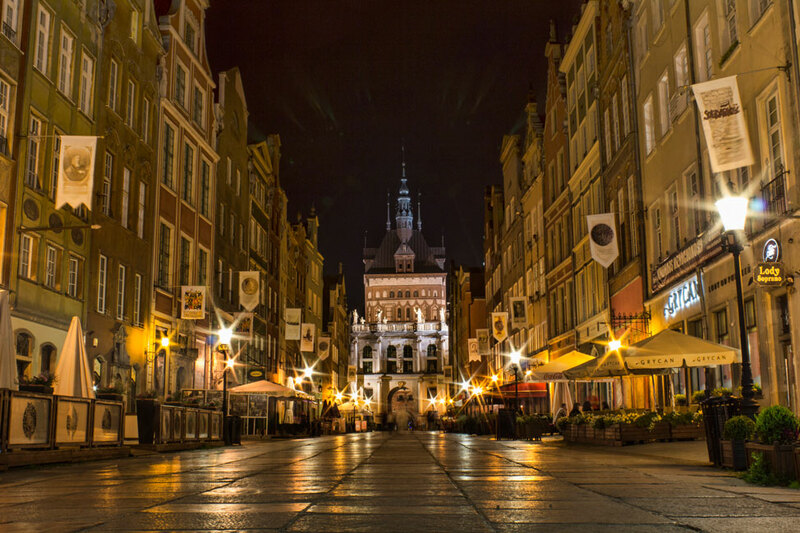 Love it, Dalene… I am just so taken with Gdansk. Cracow used to be my favourite city in Poland because as oppose dto so many others (Warsaw, Poznan, Wroclaw and, well, Gdansk), most of its substance is original because miraculously the city wasn’t as badly destroyed in the war. It is the only city I have been to in Poland that didn’t have the Disneyworld phenomenon going on. But today Gdansk is still my favourite. 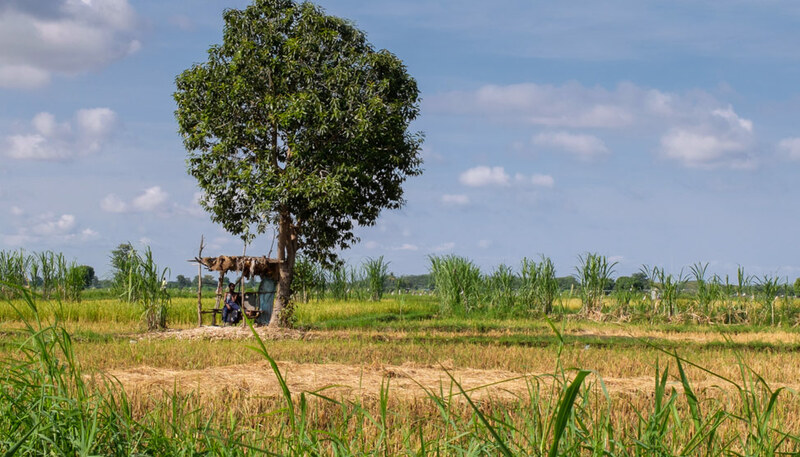 It must be to do with the water and the friendliness of the people and the amazing history of the Solidarity movement. And my family’s roots are there too. Great photos, thanks for the lovely post! I can totally understand why you like it there Mariella. The history all within that little area is quite astounding, and it has such a very cool vibe to it. I love that the citizens cared enough about their city to make it beautiful again. They could have just poured the concrete bricks and called it a day. But instead they wanted to recreate the charms of their childhoods. I think it’s beautiful! I had no idea about this! Makes me want to visit Gdansk even more. Sure looks beautiful especially along the river. Sounds really interesting, I don’t think I would’ve guessed it was fake. I often don’t realize the “old” stuff around me in Germany has been rebuilt, but it makes sense since so much was destroyed during WWII. I gotta get to Poland soon.